The handlers of Michael Jackson's probate and guardianship cases have a full slate at a hearing meant to tackle a number of estate and family issues. At least one major hurdle was cleared last week with a custody agreement between Jackson's mother, Katherine Jackson, and Deborah Rowe, the biological mother of the singer's two oldest children. Los Angeles Superior Court Judge Mitchell Beckloff has deferred hearing arguments or making rulings on several motions brought by attorneys for Katherine Jackson and the two men who have temporary control of the pop icon's financial matters: attorney John Branca and music executive John McClain. Jackson's estate has been described in court documents as having an estimated value of more than $500 million, but its actual current worth is about $100 million, and could increase in value to $200 million or more with some financial restructuring, according to a person briefed on the matter. The person was not authorized to speak publicly and requested anonymity. Branca and McClain could leave Monday's hearing with a firmer rein on the estate. Similarly, Katherine Jackson could emerge with guardianship of her three grandchildren, since her agreement with Rowe, which grants the singer's ex-wife visitation rights, means no one is expected to challenge the current arrangement. Meanwhile, Katherine Jackson said in a recorded phone interview with Geraldo Rivera that she doesn't believe her son died of natural causes. The interview aired Sunday night on "Geraldo at Large" on the Fox News Channel. "All I know that my son is dead, and I don't think he just died of natural causes or whatever," she said. "He's too young to have that. Something happened. I don't know what it was. And I can't say." In a newly-released CBS News poll, Americans believe Michael Jackson will be remembered more for his music than his personal troubles. The survey found that 66 percent of those surveyed say the so-called "King Of Pop" will be remembered more for his legendary singing and dancing than for the plastic surgery, child sexual abuse charges and erratic behavior of his later years. By contrast, one in four Americans say memories of that behavior will eclipse memories of Jackson's music. The to-do list for Monday's hearing has grown in recent weeks, with Beckloff deferring decisions on several issues, most of which have to do with Jackson's finances. • An allowance for Katherine Jackson and her grandchildren. The special administrators of Jackson's estate have asked for monthly stipends for the group, noting that Jackson supported all of them when he was alive. Beckloff delayed considering the payments until Monday, but attorneys on both sides agree they are necessary. • Decide when Katherine Jackson will become the permanent guardian of her grandchildren, 12-year-old Prince Michael, 10-year-old Paris Michael and 7-year-old Prince Michael II, known as Blanket. 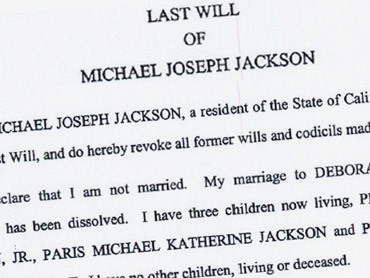 No one else has petitioned for custody of the children, and Jackson was her son's first choice named in his 2002 will. • Whether Katherine Jackson can challenge the men currently administering the son's estate, without actually contesting her son's will. Her attorneys have asked Beckloff to decide whether if they petition to remove Branca and McClain as administrators, they will trigger a no-contest clause in Jackson's trust. Without the protection of Beckloff's ruling, Mrs. Jackson could lose her 40 percent share of Jackson's estate if she mounts a challenge to Branca and McClain's authority. "She's entitled to a certain amount of financial information," CBS News legal analyst Lisa Bloom said of Katherine Jackson on "The Early Show". "Anything can come up at these hearings," Bloom said. • Mrs. Jackson's attorneys have expressed concerns about possible conflicts of interests that Branca and McClain may have, and have been seeking greater access to Jackson's records in the form of subpoenas and depositions. They sought that authority last week ahead of Monday's hearing, but were told they would have to wait until that day for a ruling. • Decide whether Branca and McClain continue administering Jackson's estate. Court filings indicate the pair have already received $5.5 million from a former Jackson financial adviser, later identified as Tohme Tohme. They have also take possession of many of the King of Pop's property, and have said in court filings that they hope to finish several multimillion deals soon. • Beckloff could be presented with some of those deals. The judge has already approved one that will bring Jackson's 1988 autobiography, "Moonwalk" back to store shelves. The singer left behind several unfinished projects and a trove of unreleased music.